Checkout the new crowd sourcing site launched by Best Buy call Idea X. Similar to the Starbucks idea site that I wrote about earlier this year, Best Buy is looking to use the power of bulk thinking to generate new and innovative ideas for its business. As with Starbucks, the ideas submitted to Best Buy are posted for everyone to see. This allows others to read, comment, and vote on their favorite ideas. Furthermore, by submitting the Materials using IdeaX, you grant Best Buy and its designees an irrevocable, unrestricted, perpetual, non-exclusive, fully-paid up and royalty free worldwide license to make, use, sell, import, modify, reproduce, transmit, display, perform, create derivative works, combine with other works, and distribute such Materials for any purpose whatsoever to the extent permitted by law. This license to Best Buy includes the right for Best Buy to sublicense these rights to third parties. Congratulations to Best Buy for setting up a real time listening post for its customers. Let’s see how they manage the suggestions and if it makes them a stronger retailer. 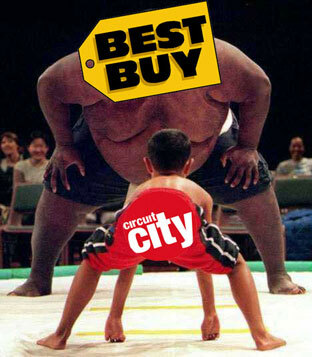 What’s wrong with Circuit City? It was reported today that Circuit City has filed for bankruptcy protection. This appears to be the last resort in a series of troubled events over the last few months. The CFO, Bruce H. Besanko, claimed three contributing factors: erosion of vendor confidence, decreased liquidity and the global economic crisis. I polled my car pool partner, let’s call him Mac, today on what he thought about Circuit City. He said that he didn’t have any bad impressions of Circuit City. In fact he could specifically remember a few of their advertising campaigns on price matching. But at least for Mac, the location of the local Circuit City was not as convenient as the local Best Buy. While reading a news story about this event I found some evidence that store locations may be part of the down-fall equation. Circuit City announced last week that it plans to close 155 of it’s store locations. One JP Morgan Analyst indicated that filing bankruptcy would further help Circuit City out of some leases in some areas that are no longer able to support the company’s mission. Maybe a downgrade in customer service and experienced in-store personnel is part of the equation also. Circuit City laid off about 3,400 retail employees last year and replaced them with workers that were not paid as much. I can definitely see this hurting business. If you’re getting ready to drop 2 grand on a new high-def flat screen then you want someone knowledgeable who can answer questions. You also have to wonder about this move from a financial perspective. Steven Rash from, Asheville NC, was one worker that was fired. He made $11.59 and hour was working 15 – 20 hours per week. But get this: Circuit City chief executive Philip J. Schoonover received a salary of $716,346, along with a $704,700 bonus last year. Could Circuit City’s limited production selection be part of the equation? How much weight does a large brand selection carry in customer’s minds as a basis for shopping? Do customers really base shopping decisions based on the number of brands carried by a store? What’s your take on this news? When is the last time you shopped at Circuit City? What’s keeping customers away from their stores? Does customer loyalty exist with big box retailers like Circuit City or Best Buy?